Cancun 101: Travel Guide, Travel Tips, Travel Do's and Dont's. Private tours Chichen Itza. Private tours Tulum. Chichen Itza information. Cancun Information. In the Spanish language, the word sendero means "path". Trace your own path into the Yucatan Peninsula’s Mayan World by booking a tour with Sendero Maya. Based in Cancun, our experienced bilingual guides will pick you up in Cancun, Playa del Carmen or anywhere in the Riviera Maya, taking you out to explore Chichen Itza, Tulum, and other ancient Mayan sites during the coolest part of the day, before the crowds arrive, so that you may enjoy the unique serenity of these ancient treasures. This site is dotted with structures of ancient architectural styles. The city of Chichen-Itzá has stepped pyramids, temples, an observatory and the largest Mayan ball court known in the Americas. Chichen-Itzá as a whole encapsulates the connection the Mayans had with the universe. The most admired structure, the Temple of Kukulkan, was built to have 365 steps, each symbolizing the total number of days in the year. The pyramid was built in such a way that, during the spring and autumn equinoxes, a shadow descends in the shape of a serpent, making its way down to the base of the pyramid. The astronomical skills the Mayans perfected were exquisite and nearly flawless compared to modern science, as they could even predict solar eclipses through their stone observatory. Enjoy a spectacular view of the Caribbean Sea as seen from one of the best preserved Mayan coastal sites. The city of Tulum has palaces, temples, preserved fresco paintings on walls, and a stunning panoramic view of the beach. It is built over a cliff that towers over the Caribbean Sea, which once made it one of the most important Mayan ports of trade. Trade in obsidian rock was made both by land and sea, flooding the population with riches that allowed artists to make fresco paintings on the walls of the most important spiritual centers. This site offers a glimpse into the world of Mayan society, from its sectarian classes to the richest and most spiritually connected shamans, from the merchants and traders sailing their canoes onto land, to the peasants who would set the city in motion like clockwork. Cobá: Home to one of the tallest Mayan ruins--and one of the few that may still be climbed. Arguably the Mayan hub of the Americas, it is a city with "Sacbe" or "Sacbeob" in the plural, which are a series of paved road networks connecting Coba to important Mayan cities such as Chichen-Itza, Tulum, and other important cities. Coba is scattered along a series of raised paved trails that connect you to every structure the site has. Nestled in a jungle between two large lagoons, this Mayan site houses the tallest temple in Yucatan that you can still climb, the Mayan ball courts, great Mayan paths, and encryptions on stone carvings throughout the city. 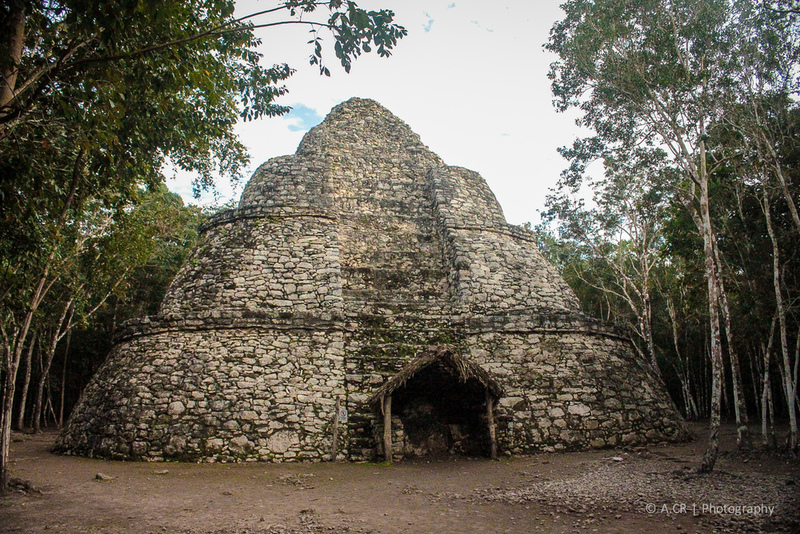 Experience the Nohoch Mul group of the largest pyramids in the Yucatán peninsula. Climb the 42 meter (138 ft) Ixmoja structure to enjoy an astounding scenic view over the jungle.